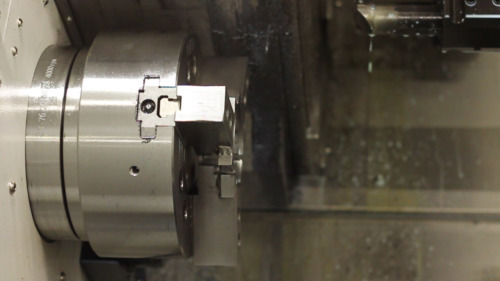 CNC Machining - Dubuque Stamping & Manufacturing, Inc.
Our CNC machining department consists of three HAAS VF-3SS mills, one Single Spindle HAAS ST30 lathe and one Dual Spindle Mitsubishi LT2-76YM lathe. Our HAAS mills are equipped with pallet changers with a 20” x 40” pallet which allows us to keep our machines running while we are loading parts onto the fixtures, thus increasing the throughput of the machine. The HAAS lathe is a single spindle, single turret lathe equipped with a 10” chuck. The Mitsubishi lathe is a dual spindle (10” chuck on the main spindle and 8” chuck on the secondary spindle), dual turret machine with live tooling capabilities. This lathe allows us to run two operations at the same time or run two parts at the same time thus increasing the throughput compared to our single spindle HAAS lathe. Two, three or four hole flange styles are available. Additional in-house processes such as Blanchard grinding and Gardner double-disc grinding are available along with drilling and tapping to provide higher-quality finishes and holes.